The head of the UK’s central bank has issued a fresh warning about the economic impact of climate change and, in particular, on the huge costs that wild weather could wreak on insurers and other financial institutions. In a speech, Mark Carney told a gathering of leading insurers this week that the threat posed by climate change would "pale in significance compared with what might come". The failure to rein in greenhouse gas (GHG) emissions would saddle future generations with potentially unmanageable costs. Following the launch of a report by the Bank of England on the issue, Carney told insurers they should stress-test the effect of weather-related disasters on their balance sheets, and revamp investment portfolios to shrink their contribution to manmade climate change. "While there is still time to act, the window of opportunity is finite and shrinking," Carney told an audience at the headquarters of UK insurance company Lloyd’s of London. 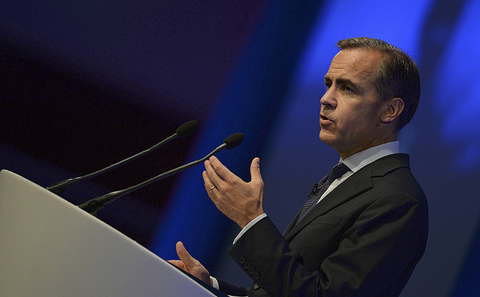 The Bank of England governor also revisited a theme he highlighted on several occasions last year, namely the exposure of carbon-intensive companies to future regulation and costs related to climate change. Carney said the UN climate summit in December should discuss an industry-led 'climate disclosure task force', where companies dependent on fossil fuels should provide detailed data on the GHG emissions they are responsible for. Scientists estimate that if the world is to restrict a rise in global temperatrures to 2C, the amount of coal, oil and gas that can be burnt would amount to between one-fifth and one-third of the world’s proven reserves of the fossil fuels. “If that estimate is even approximately correct it would render the vast majority of reserves ‘stranded’ – oil, gas and coal that will be literally unburnable without expensive carbon capture technology, which itself alters fossil fuel economics,” Carney said this week. Groups that campaign for financial institutions to divest from fossil fuels, and those who are pushing for the impact of climate change to be reflected investment portfolios, welcomed Carney's latest statement. His call is also seen as particularly timely as pressure mounts on the private sector to support efforts to negotiate a meaningful deal in Paris. “Mark Carney spoke under the Lutine Bell, the way Lloyd’s has signalled great events that will affect the market. He chose his setting perfectly. We welcome his focus on more consistent and reliable carbon disclosure that will allow investors to make a more informed assessment of the climate risks in their portfolios,” said Stephanie Pfeifer, CEO of the Institutional Investors Group on Climate Change. A report last week said that financial institutions worth US$2.6 trillion, including pension funds and private companies, have pulled out of investments in fossil fuels, freeing up more capital for investment in low carbon energy. Warnings that the resources sector, and the companies that invest in them, could be saddled with big losses if the world moves to cut carbon have resonated strongly this year. Demand for coal in China has slowed sharply as the world's largest consumer of the fuel tries to tackle pollution caused by the use of fossil fuel in power generation. However, an economic slowdown, new additions of renewable energy to the power grid and a plentiful supply of hydro power have also contributed. Companies involved in the production and transport of fossil fuels, and energy-intensive materials, such as steel and cement, have cancelled new projects and shuttered existing capacity amid further falls in commodities prices. The meltdown this week in the share price of Glencore, one of the world's biggest commodities companies, was a further reminder of the parlous state of the sector. However, producers claim prices for fuels, such as coal, will eventually recover in view of curbs in supply and demand from rapidly industrialising economies, such as India. And gas producers continue to talk up the prospects of a fuel that is cleaner-burning than coal, albeit a major source of GHG emissions too. But supporters of the divestment campaign point to likely structural shifts in the power generation mix decisively towards renewables in large economies such as China, US and the EU. A trend they say will render many fossil fuel producers uneconomic in the future.